There are luxury beauty products, and then there are Pat McGrath’s products! Arguably one of the most famous makeup artists out there, Pat is known for her revolutionary skills and dazzling results. Thus, when she launched an eponymous brand of makeup, we sat up and took note. After much hemming and hawing (trust me, it isn’t easy to pick just one product! ), I decided to splurge on a lipstick for Christmas. Here is my review of the LuxeTrance Lipstick in ‘Beautiful Creature’. First off, I would like to give the brand’s packaging team a huge pat on the back! Each lipstick comes housed in a stiff, cardboard box, with a cord to open it up. 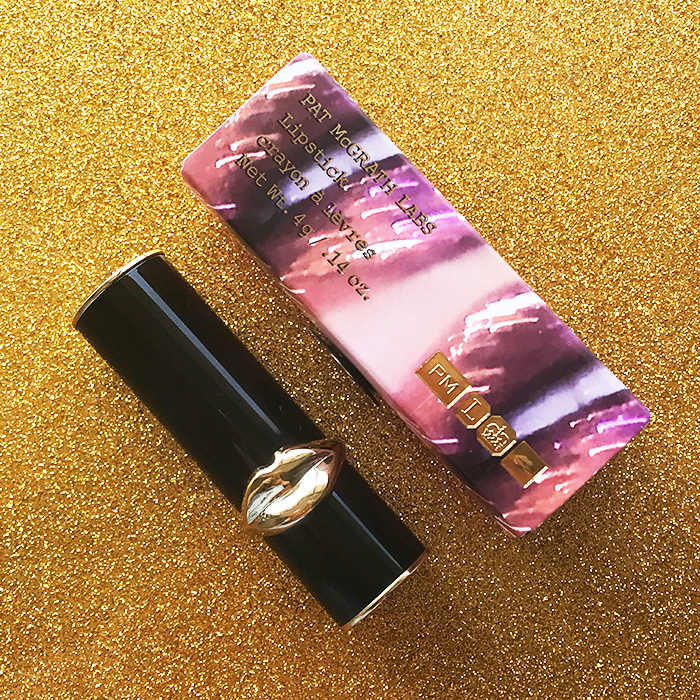 The box is imprinted with an artwork of lips and features the shade name in gold lettering. The lipstick itself is encased in a glossy, black and gold tube, which snaps shut with a click. Personally, I loved the addition of the gilded lips as it really added an opulent vibe to the product. On the formula front, there’s no denying that this lipstick is more than worthy of the attention it gets! Due to its creamy consistency, it went on smoothly, without any tugging or flaking. Where it really shines though, is its amazing pigmentation. One swipe is enough to coat your lips entirely – a feat that is so rare in the makeup industry! ‘Beautiful Creature’ is a muted plum shade with warm undertones and a slight sheen. Although the texture feels velvety, it’s important to note that the lipstick itself is quite lightweight. Since I’ve been loving how the shade looks on me, I’ve pretty much been wearing this lipstick everywhere. No matter how many coffees I gulp or cupcakes I snack on (hey, a girl needs her fuel! ), this baby stays mostly untouched. The colour usually stays rich and creamy for about 6 hours, without bleeding or settling into the lines of my lips. Post that (or after a heavy meal), it fades evenly into a stain. The biggest plus however, is that it keeps my pout hydrated despite the cold temperatures outside. Pigmented, plush and long lasting, this lipstick lives up to all the hype surrounding it. Although my bank account won’t be happy, I’ve got no doubt that I’m going to be picking up a few shades from this range! Posted on January 24, 2018 by Glossip Girl and filed under Lipstick and tagged Pat McGrath.